Hi, I'm Jeremy Zuck with BBF. This is our enterprise collection. This is hard working commercial grade furniture dressed in a contemporary style, works very well in both a home or a professional environment. It's available in both a mocha cherry finished which you see here today and also a lighter harvest cherry finish. Enterprise is a straight forward collection, which offers a number of different configuration options. We have it set up today in a 72" L-desk with a 72" inch hutch. It's also available in a 60" L-desk with a 60" hutch. And both 60" and 71" double pedestal desks, both sides also work on the double pedestal desks. Finally, we have a lateral file and lateral file hutch and to round out the line we have a small space corner unit. Enterprise offers very quick and easy installation. The pedestals are all completely assembled at the factory and you can pull them out of the box and be ready to go; all pieces in the line assemble in thirty minutes or less. Let's talk about some of the features. First the desk surface, which gives you plenty of room to spread out and get your work done. There's also a four port USB hub recessed into the desk surface itself, which allows you to plug in electronic devices and stay powered up. There's also wire measurement cut out in the back of the desk as well. The brushed set nickel hardware and accents also are a very nice detail. The thermo-infused 1" thick laminate surfaces on the desktop are very durable and hardworking and will work as hard as you do. The desk itself, we have fun of closed storage. All of the drawer feature full extension ball bearing drawer slides for easy access to contents at the back of the drawer and years of use. Let's move on to the hutch. This tack board is a great convenient feature. You'll also notice the recessed lighting underneath for extra visibility. On top we have a mixture of open and closed storage. These open working process trays are great for storing papers, folders, books, or other items of that nature. Inside the closed storage we have this convenient lid-stay hinge, which allows the door to stay up what you're accessing contents. And then you simply push your down when you're done. There are a number of wire management features on the hutch including a channel on the side for routing wires and there are also cut out on the shelves for bringing power up into the close section of the hutch. Enterprise is backed by our 10 year manufacturer's warranty. And it's also tested in our laboratories to professional ANTI/BIFMA standards. So you can be confident that it's going to perform as well ten years from now is it does on the day you buy. This is the Enterprise collection by BBF. Check out all the features the BBF Enterprise collection can bring to your office space! Made with quality in mind, these desks have plenty of storage and working space for your busy work environment. 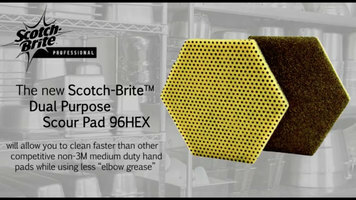 You don't have the time to spend scouring pots and pans with inefficient pads, so switch to the Scotch Brite™ Dual Purpose Scour Pad 96HEX. Designed with two different sides, the pad is perfect for a variety of scouring tasks, providing you with the efficiency needed to expedite the cleaning of heavily used and dirty cookware. Watch this video to see the pad in action! 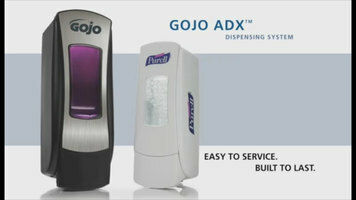 Learn how the GOJO® ADX soap dispenser can help you maintain your clean facility! With smart engineering, a robust construction, and a sleek design, this dispenser is both an innovative and reliable addition to kitchens and restrooms. Both convenient and eco-friendly, Green Herc t-shirt bags are perfect for grocery stores, delis, and take-out restaurants. 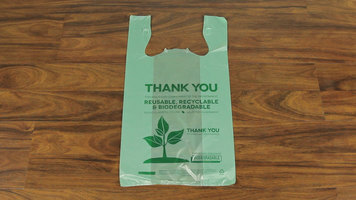 They are just like regular plastic t-shirt bags, but are biodegradable and healthier for the environment!